An avid student of self-development, I’ve been reading books, listening to audios, taking part in mastermind groups and attending seminars on a wide variety of topics for more than 17 years. 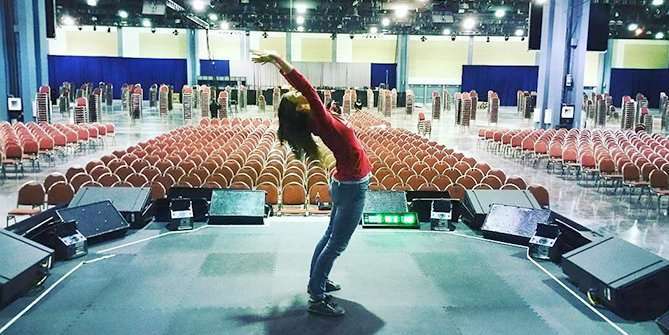 This weekend I had my first opportunity to volunteer at a Tony Robbins Unleash the Power Within (UPW) event and get a behind-the-scenes experience. I was given the opportunity to be a part of the “Fab 5” team without knowing anything about the actual role. Eventually I found out this is a fun name for “warehouse and logistics”. Charles Hawkins was our fearless leader and had a unique teaching style that was very different from anything I’d experienced before. He merged his military background with the world of leadership and personal growth. From the beginning, Charles told us that the “Fab 5” team was about more than moving boxes. It was a tremendous leadership opportunity that would translate to all of our lives. The lessons learned were phenomenal and got me thinking of how as Pilates instructors, we take on leadership roles with our clients. As we evolve in our Pilates careers we also become examples to newer instructors that come on board. Here are 9 points I learned this weekend that I’d like to translate to the Pilates studio setting. Leaders have a vision and keep the big picture in mind. When working with clients, my personal vision is to leave them feeling physically better than before and have them enjoy their time with me. I make a point of doing this with every client regardless of what specific exercises or program we do that day. If they feel better, move better and enjoy themselves they’ll want to maintain a movement routine. This will keep my clients movers for life and help maintain their health and wellbeing. What’s important for you to bring to your clients? What vision do you have for them and how can you express it? Leaders ask for clarification. It’s important to know why your clients are coming to Pilates and what they want to get out of it. That way, you can tailor your programming to meet their needs. Listen with your eyes not just your ears. When you step back and observe what people do rather than what they say, you may notice two very different pictures. Most people don’t do what they say or mean. Does that make them liars? Not necessarily. But their interpretation of reality may be different, they may stretch the truth out of habit or just be confused. Noticing their actions, facial expressions, tone of voice, etc. can help give you even more information about what a client really wants, even if they can’t articulate it. Leaders must set their students up for success. It is your job to make sure your students have the tools and resources available to them to be successful. You’re the expert, so if your client is excelling in one area (like hip mobility) and needs more work in another (scapulohumeral rhythm), set up their programing to support what they need. Leaders work with a team and ask for assistance when needed. Sometimes we think we can or should do everything on our own. As Pilates instructors we love to fix things and make people feel better. However, some circumstances are beyond our scope of practice. It’s important to have a good network of manual therapists and understand how they work. That way you can refer when appropriate and do an even more effective job with your movement training. Leaders have fun along the way. It’s so easy to get focused, be serious and forget to have fun along the way. Life’s too short not to enjoy the time you spend each day. Leaders take the time to slow down on purpose. In todays day and age, we’re always in such a hurry to get things done. While doing so, it’s easy to miss something. When you step back to observe, you may find you come up with better and more purposeful solutions than if you just jumped on it right away. Leaders realize that small changes and incremental improvement lead to huge results over time. When beginning a new diet or exercise program it’s easy to notice big changes in the beginning. After a few weeks, many plateau and may feel as though nothing is happening. That’s simply not true. Once we get our basics down, it’s an opportunity to make 2mm shifts as our mind integrates with the body. Start paying attention to progress over a 3-6 month period of time rather than week to week because movement is a lifelong journey. Leaders celebrate milestones, even small ones. Attending Tony Robbins programs has been a shock to my celebration system. There are so many hi-5’s and constant celebration you can’t help but feel good about yourself. This might be a bit extreme to bring back to a studio setting, but pointing out the good things our clients do and recognizing them for the improvements they do make is so important. Reflecting on the weekend I’ve just experienced with Charles and the “Fab 5” team at UPW made me realize we all have the ability to lead. Sometimes it needs to be pointed out to us and practiced over and over until it becomes second nature. Whether a major change or a micro improvement in our leadership skills, those around us will be positively impacted. I challenge you to choose one thing you will go out and implement today. You’re welcome. The whole weekend is filled with opportunities for insight on soooo many levels. You’d absolutely LOVE it Helen!